Sausage is defined as ground meat mixed with fat, salt and other seasonings, preservatives, and sometimes fillers. Some sausage mixtures are sold in bulk form, and others forced into casings to form links. Many people are familiar with sausage links, but they are readily available without their casings in the same way fresh ground beef and chicken is packaged. Sausage is available in fresh form, which needs to be cooked before consumption. It is also available in dry or cured form, which is already cooked. Virtually any type of meat can be used in sausage, but most common sausage are pork or pork blends with other meats such as beef or chicken. Sausage variety truly is the spice of life, and is available in a number of ways, including spicy, hot sausages and bland sausages, as well as with flavorings running the gamut from garlic to nutmeg. The word sausage comes from the Middle English sausige, which came from sal, Latin for salt. In France they are sausissons and in Germany, wurst. In practice for over a millenia sausage-making was originally a method used to preserve meats, especially lesser cuts. Today, sausage-making has become an art. More than 200 different varieties of sausage are made in the United States alone, and thousands more worldwide, varying by regional tastes and ingredient availability. Hot dogs are popular in the United States, sausage is the ultimate Finnish fast food, and seafood sausages are popular in Asia. Traditionally a meat product, creative chefs are making sausages from vegetable and seafood blends for those who eschew meats. 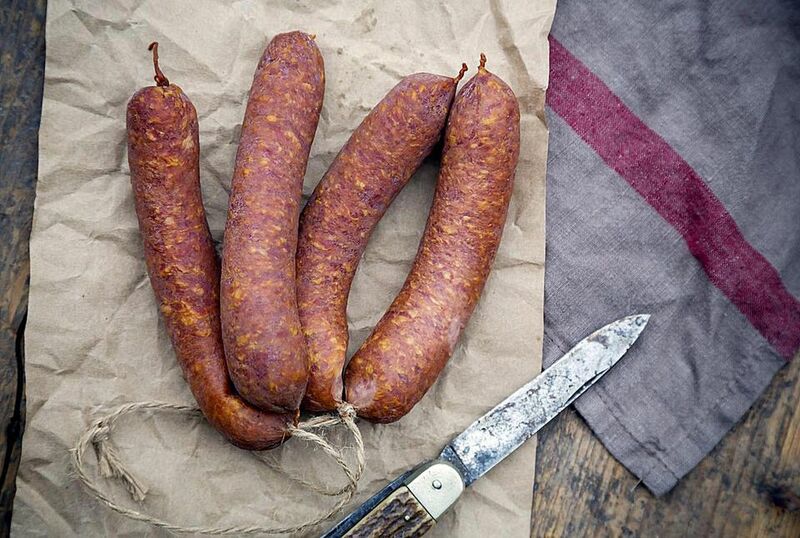 There are even meat and rice blends available in sausage casings called boudin, pronounced boo-dan, made popular in Southern states such as Texas and Louisiana. Boudin sausage is becoming more popular, and the ingredients more complex, as it gains exposure. Emeril Lagasse has shown an interest in the dish and has taken the traditionally pork and rice dish to another level with unique mix-ins that more cooks are expanding on. You may shy away from commercially-made sausage fearing not only fat content, but what odds and ends manufacturers dump into the mix. And, rightfully so. For your convenience and conscience, there are ways to lower the fat, if you make your own at home. What's more, if you make your own sausage, you can ensure only the best ingredients and spices are used. The featured sausage recipes (linked below) also include seafood and vegetarian sausage blends.